I’m betting my bottom cactus pad that many of us heard first of agave in connection with tequila. It’s only been recently that it came back into our field of vision as the ‘new health food’. Natural? Healthy? Not so fast. Just like every other miracle sweetener that hits the market, it can take some work to find the fine print on this one. 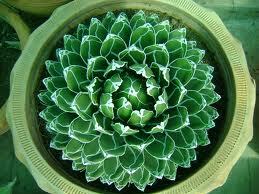 Reader Jan recently- brought the agave question to my attention, a perfect opportunity to share my findings with you. 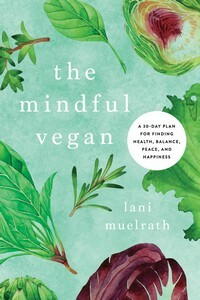 Q. Lani, can you explain a bit more on agave? From what I thought, it [was] extracted (naturally), from the plant, but I guess I’ll have to learn more about it. I used to use Splenda in my coffee, but gave that up when I changed over to a plant-based diet. I don’t like black coffee, that’s all. I’d like to continue using agave. I only drink one cup of regular, unflavored coffee in the morning, so it’s not like I’m drinking 5 or more cups a day! Great question Jan and happy to help. To begin with, the primary form of sugar in agave, just like that in high fructose corn syrup (HFCS), is fructose. Remember, fructose is metabolized by the body in a different fashion than other sugars. Instead of going into the blood stream, where it can raise blood sugar, it goes, for the most part, directly to the liver. This explains why fructose has a lower glycemic index (GI), which is why many people promote it. But that’s only part of the story. Though the consumption of fructose tends not to raise blood sugar, fructose – or for that matter any concentrated sweeteners high in fructose – can result in elevated levels of triglycerides, associated with increased risk for heart disease and insulin resistance. Fructose may also not affect your satiety center as well as pure sucrose, which basically means you don’t feel full as fast . Over consumption of calories, beyond your caloric needs, can thus more easily take place. And we all know what over consumption of calories leads to. Long short, to stay out of trouble when trying to lose weight and gain health, processed, concentrated sugars of any kind should play a small part in our diet – especially those high in fructose – for those with health concerns. With that as rule number 1, which sweetener you pick may not be as important as how much. Make it only a little of whatever you choose, and it probably doesn’t matter which sweetener you use. For example, if your only added sugar for the day is a teaspoon of agave syrup on your oatmeal, you’re probably fine. But if you make muffins with 1/2 cup of agave syrup and have a few of those, it could be problematic. Sweeteners with a stronger flavor get more mileage than those that are lighter flavored and simply sweet. For example, sucanat has a strong flavor in addition to the sweetness, giving it more sweetness mileage. Same with maple syrup and coconut sugar. 1. Br J Nutr. 2008 Nov;100(5):947- 52. Consumption of fructose-sweetened beverages for 10 weeks increases postprandial triacylglycerol and apolipoprotein- B concentrations in overweight and obese women. Are you getting all the news that’s healthy, fit, happy and hot each week? Click here to join 1,000′s of others + get your weekly health, body shaping and food advice for free from the Plant-Based Fitness Expert. Very helpful post…it’s always nice to have a little more clarity on the sweetener situation. Many thanks! Thanks Moonsword for your note! It can be so easy to get lost in these debates. A little info can help things along, and as we limit how much uber-sweet we use anyway, that helps. I was using agave until I kept reading more and more negative things about it. I switched to stevia. What are your thoughts about stevia? Is it safe to use? Thanks for your note. Stevia is safe to use, though personally I’ve never liked it – it leaves a bitter something in the mouth. Stevia is cheap and easy to grow. This sweetener is used as dried leaves, a white purified extract, and as a liquid. In the US, Stevia is sold as a “dietary supplement,” rather than as a replacement for sugar for legal reasons. Stevia is not approved by the FDA, nor is it endorsed by the American Dietetic Association as a nonnutritive sweetener. The lack of official support has been attributed to pressures from the sugar and artificial sweetener industries. 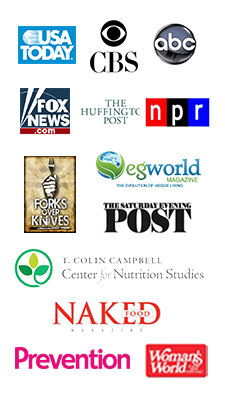 The American Dietetic Association receives their funding from many industries, including those that manufacture artificial sweeteners and foods made with these sugar-substitutes and natural sugars. Thanks so much for the info about stevia. What do you use as a sweetener? Also, I was wondering about the fructose in fruit. Should we limit the amount of fruit we eat as well? Snowgirl, fructose in fruit is bound with the fiber and not refined as is agave syrup, so a whole different picture when it comes to assimilation by the body. Some people need to limit fruits due to elevated triglycerides, and that can be a cause for limiting. Other than that, enjoy and just be sure you aren’t crowding out the vegetables and starches with the fruits – it’s so easy to eat buckets! I use sucanat, sometimes coconut sugar ( a new find! ), occasionally turbinado and brown rice syrup. As I only use a sprinkle or a splash, it doesn’t really matter. In baking I’ll use the sucanat or coconut. I like the stronger, sweet flavor as it gives the sweet extra miles and legs! Thanks Anna! Always happy to see your reflections. I’ve been eating plant-strong for 7 months now and at first my lipids plummeted. I was also taking 500 mg of niacin, but decided to experiment and stopped it. Everything went up 3 months later, just enough that my total is now 219, LDL 1 over the “limit”, and triglycerides very close. ugh and ugh. So I started niacin again, but am really trying to remove all the little “good” fats if I can (like I’d do 1-2 tsp of pb or almond butter/day and have a few nuts and sometimes avocado and now I don’t) and cutting back on fruit–maybe 1/2 as much now, like a serving for breakfast and another small one. I use a little stevia and used to use a little maple syrup. I stopped the syrup–at least for now. Trying to do more McDougall-style eating. I don’t know if I’m missing something or what. I wish I didn’t have to wait 3 months in between each test! 🙂 I can at least be grateful my dr lets me experiment as I like (after being so impressed with the initial drop of 64 points in my total). I will absolutely not ever take a statin and I won’t ever go back to any other way of living. I feel great –at 68. Thank you, Lani! I think I may have read the story before, but it was very good to re-read all of that and to have your note on how she limits her fruit. It helps to have support and encouragement! 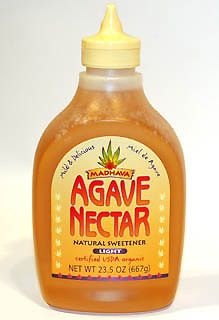 Agave is the “newest” “healthy” sweetener on the market…I wonder what will be next? 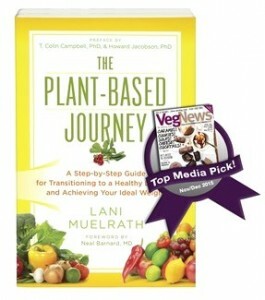 Thanks again for helping all of us on our journeys to greater health! Hi Kristie! Thanks for sharing your discoveries – I see we have something else in common! I so appreciate you coming by, and your kind words. Happy to be on this journey with you. Thank you Kristie for adding to the conversation, I appreciate!